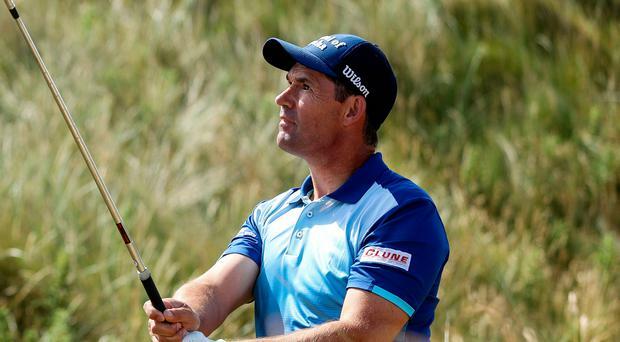 Padraig Harrington made a mockery of his pre-tournament odds when he opened with a super 68 to move into contention for the Dubai Duty Free Irish Open at sun-kissed Ballyliffin. On a day when anyone watching Rory McIlroy from tee to green (but not putting) would have bet the house on him shooting in the mid-60s rather than a frustrating 70, Harrington rolled back the years to go into today's second round just a shot behind New Zealander Ryan Fox after shooting four-under-par 68. Locked in a seven-way tie for second with the likes of Lee Westwood and Danny Willett, the three-time Major winner had every reason to be upbeat after thrilling the 13,716-strong home crowd with some vintage play. "It's not often there's value in my game," Harrington said with a big grin when reminded about his pre-tournament odds of 66-1. "The bookies in Ireland would make sure they cut you to a low price knowing that sentimentally people would back you. "I was surprised. The bookies don't normally get it wrong, but to put me at 66-1 on a links golf course was strange on their part, at home in my home country. "My performances always go up when it comes to a links course. Maybe that says I'm even worse than I thought!" Harrington's game is never far away and while he struggled early in his round and was one over after six holes, his round turned when he chipped in for an eagle at the par-five 17th, his eighth, then got a line of sight drop from heavy rough at the 18th and managed to save par. "I needed momentum at that stage," he said of his chip-in eagle. "I played well early on and 15, I played really badly and maybe things were starting to get away from me and just to chip-in and get myself under par, it's always nice." When he pulled off a difficult sand save at the first, Harrington was well and truly off and running and after making three birdies in four holes from the fourth - the pick of them a gallery pleasing two after a wedge to six feet at the 170-yard seventh - he made another trademark par save at the eighth. Trying to cut the corner of the dogleg, he plugged his tee-shot in the revetted face of a fairway bunker, advanced the ball to within 92 yards of the pin and got up and down for his four. "It could have been a lot better," Ulsterman McIlroy conceded after a 32-putt round. "It's the best I've hit the ball in a long time, I just struggled on the greens. I'd love to be able to say I'm saving them for a couple of weeks' time. "What I saw out there was really good and I just need to continue to do that and just hole a few more putts. If I could improve as the week goes on, heading into Carnoustie in that aspect, I'd be really happy. "I'm not walking away from this round satisfied but I'm very happy with one part of my game and not happy with the other. "I guess the positives outweigh the negatives at this point and hopefully, if I can just chip away at those negatives over the next few days, I'll be happy." It was a frustrating day for Shane Lowry, who turned a potential 68 into a 72 when he three-putted the 15th, failed to birdie the par-five 17th and then did well to bogey the 18th from eight feet after flying the green from the deep rough on the right. Paul Dunne was three over par with six to play but despite struggling from the tee, he managed to scramble for a one-over 73 that leaves him tied for 66th with Cormac Sharvin, Gavin Moynihan, Paul McGinley and Colm Moriarty, who closed with a double-bogey six at the ninth. "Laziness," Dunne said of the double bogey at the second that erased his opening birdie. "I hit it out of bounds with a two-iron with the rest of Donegal on the left.